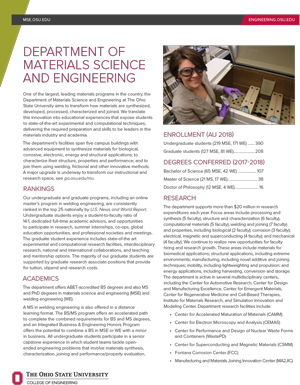 Thank you for visiting the Alumni homepage for Ohio State's Department of Materials Science and Engineering. You'll find contact information and news and updates about our alumni and learn how you can help support current and future students. Stay in touch with the department by keeping your contact information up to date. Learn how your support can make a significant impact on our students' success. Read past issues Watts News magazine on-line. Includes updates on students, alumni, faculty, and staff of the MSE-WE department. The Ohio State University Welding Engineering Alumni Society. Provides information on upcoming activities, employment, networking, alumni contacts and much more. Learn more about the many activities and services available to the more than 43,000 engineering and architecture alumni. You'll find information such as the College of Engineering football tailgate party schedule, alumni gatherings and reunions, alumni E-news, Alumni Hall of Fame, and the alumni directory. Dedicated to connecting alumni, students and friends of the university in lifelong support of Ohio State and each other. Includes information on reunions, membership services and classmate search. Menu of alumni-related links, including alumni clubs and societies, university newsletters, ticket information. The OSU WEAS provides support to The Ohio State University (OSU) welding engineering students and faculty, and to promote professional development and fellowship among OSU welding engineering graduates. Includes information on OSU WEAS membership.